A few months back, in November of 2014, Thomas Mitchell posted a photo of Team Strange on Custom Cockers. Team strange was based out of Florida and during the mid 90s competed as an Amateur team in Florida and South Eastern events such as the World Cup and the Splat 1 National Indoor Championships. 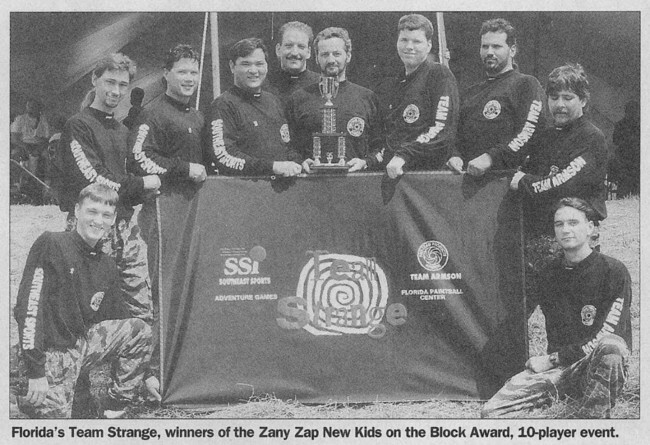 Team Strange at break during the 1995 NPPL World Cup in Orlando Florida. 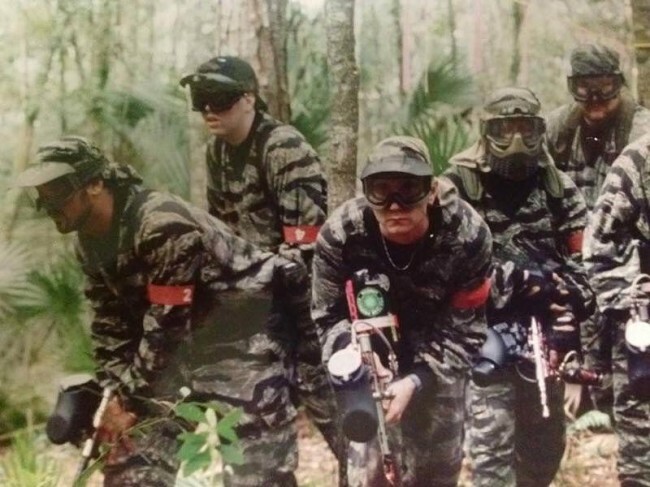 Left to right: Don Binkley, Joey Blute, William “BJ” Jolley (in the front), Mike Smalls (in the crossfire goggles), and Tim McClendon in the back. Photo courtesy Thomas Mitchell/Don Binkley? Florida Paintball Center, owned by John Gross, and later Gross’ stepson, Joey Blute, worked on many of the Autocockers and Automags used by Team Strange in the mid 90s. Blute even played on the team. A Russell Breeden Sniper 3, anodized in the Team Strange Colors of Red, Black and Silver. Front side of Team Strange Pullover from Tim Schloss’ collection. Photo courtesy Matt “Maggot” Kohler of Otter Customs Paintball. 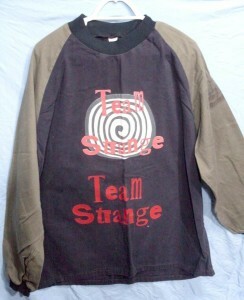 Back side of Team Strange Pullover from Tim Schloss’ collection. Photo courtesy Matt “Maggot” Kohler of Otter Customs Paintball. “That is a pic from the 1995 world cup where we took [4th] in the amateur division. Back them they had Pro and Am so the am division was tough. We got walked dry in the finals but that was our first year in 10 man. 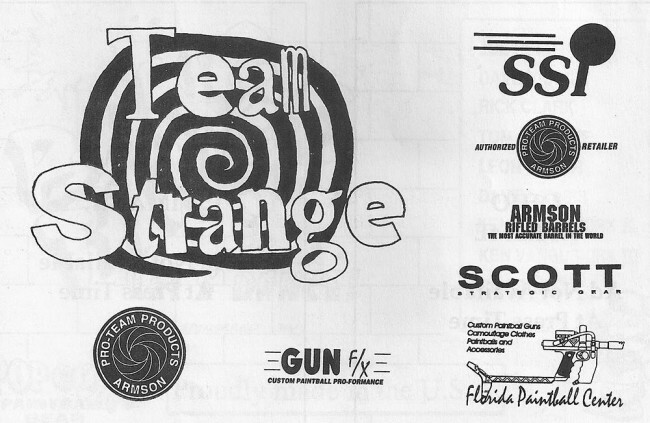 Team Strange picture from the 1995 International Amateur Open in Pittsburgh, PA. Scanned from the January 1996 issue of APG. I also found another photo from the 1995 Pittsburgh Amateur Open in the January 1996 issue of Action Pursuit Games. Strange finished 24th in this event. This event would have likely taken place before the World Cup so it could be the first 10 man Strange played with the World Cup being one of the next few 10 man events they competed in. The same Team Strange group photo, but numbered. Photo from the International Amateur Open in Pittsburgh, PA. Scanned from the January 1996 issue of APG. I also found this post on Rec.Sport.Paintball about Team Strange’s finishes in the World Cup around that time. Joe Martin, of Team Strange (but not pictured above) writes that Team Strange finished 4th in 1995 and 26th in 1996 on 11/1/1996. 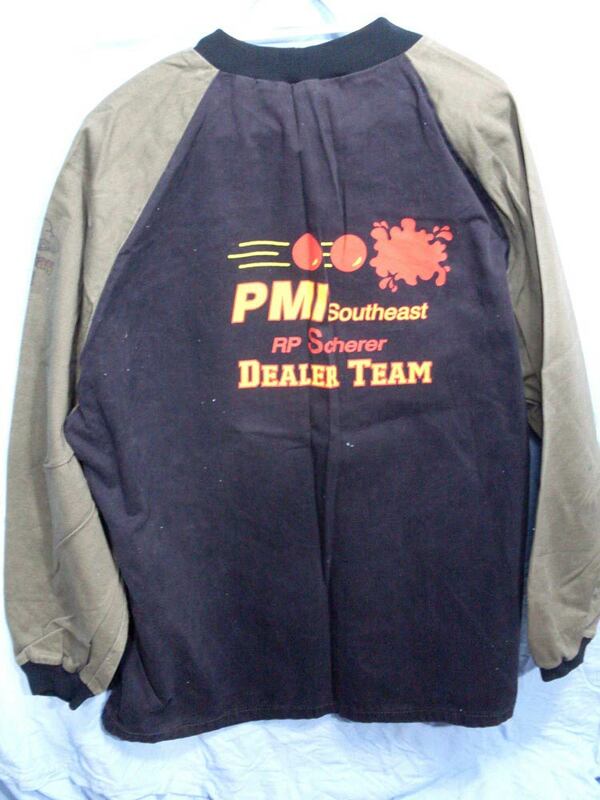 Thanks to Robert Peterson for the information on Team Strange, Thomas Mitchell for the photo of Team Strange at World Cup 1995, to Chuck Link for the Splat 1 Indoor brochure and to Matt “Maggot” Kohler for the photo of the Team Strange pullover.